The third edition of the snowfins was held with TOMSK from November 15th to 20th. As the previous, this competition was prepared with a great professionalism by the team coordinated by Natalia GRECHIKINA and Andrey BURAKOV. 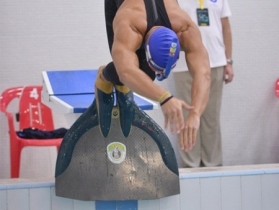 The competitions had place in the swimming pool “Akvatika” directed by another member estimated in the family of finswimming, Evgueni SKORJENKO. This year, four continents were represented, America, Africa, Europe, Asia for this unique competition in finswimming. “Unique” both for the organizers and the swimmers. This competition has a completely particular environment in this small swimming pool of 25M but makes it possible to the swimmers to be found at one period of the year, far from the great international expiries and thus in an excellent environment. High level friendship and competition are thus two other characteristics of this competition. High level because, let us not forget that this competition was equipped overall with 25000 USD of price. It is also for that this competition is unique. The delegation of CMAS was received by all the local authorities and note that Mauricio FERNANDEZ and Loukas KARETSPOULOS were also received by Mrs Oksana KOZLOVSKAYA, president of the regional Duma of Siberia. The last Day, we attended the “Sprint CMAS Cup” winned by Vasilisa KRAVCHUK and Pavel KABANOV. Then, all the delegations found themselves for the evening of awarding ceremonies with the presence of all the sponsors of this competition.